From earliest times, man has sought to project his thoughts through signs or symbols. At first this took the form of hieroglyphics, a picture or object representing a word, written either horizontally (and read from left to right, or right to left) or vertically. Gradually, the transition was made to fine reed pens with either red or black ink, which created thick strokes. This opened the way to the cursive, Hieratic, script of which three types came into use: a book hand, used for literary works and official documents; a business hand, and a religious book hand, which more closely resembled hieroglyphic than the other two. 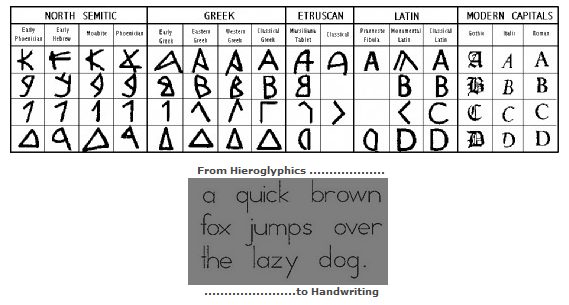 About 650 BC a new cursive style replaced the Hieratic. Demotic writing, which became a popular form, developed from the Hieratic and retained the features of the hieroglyphic system, including word and phonetic signs. The conversion from hieroglyphics to handwriting was the next natural transition. Primitive writing was ideographic as opposed to phonetic. Some cultures evolved rapidly towards phonetic writing in which conventional signs or letters represent a sound. However ideographic writing still exists in the Chinese and Japanese ideograms of today. Interestingly early Hieratic writing in Egypt showed an emphasis of curves over angles reflecting the people, who led a largely pastoral and relaxed way of life, with a gentle and receptive disposition. On the other hand, the writing of the Moabite or Phoenicians, who were essentially traders, showed a preponderance of angles over curves depicting a decisive and authoritative personality, self-disciplined with control over sentimental characteristics.